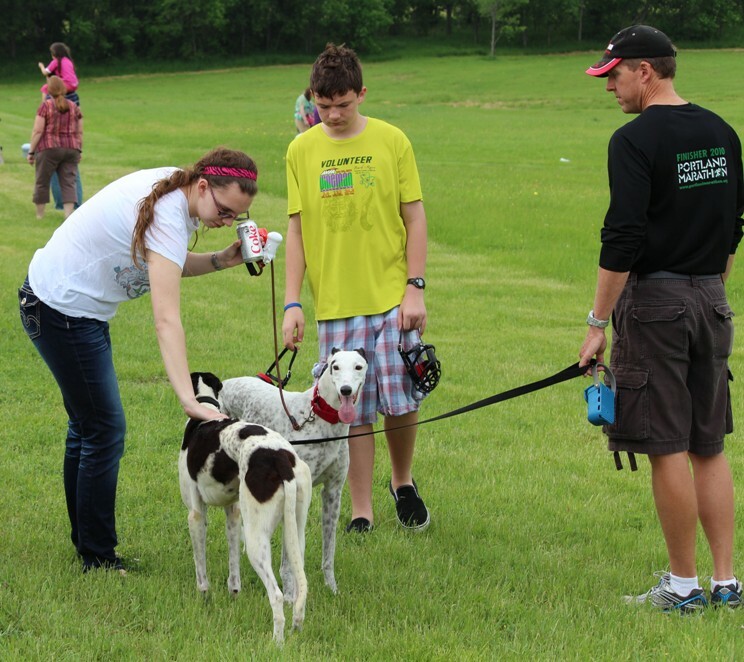 Saturday, October 27, 2012 – Lure Coursing Event: Everyone was so looking forward to the lure coursing event, but the weather was a little worrisome. 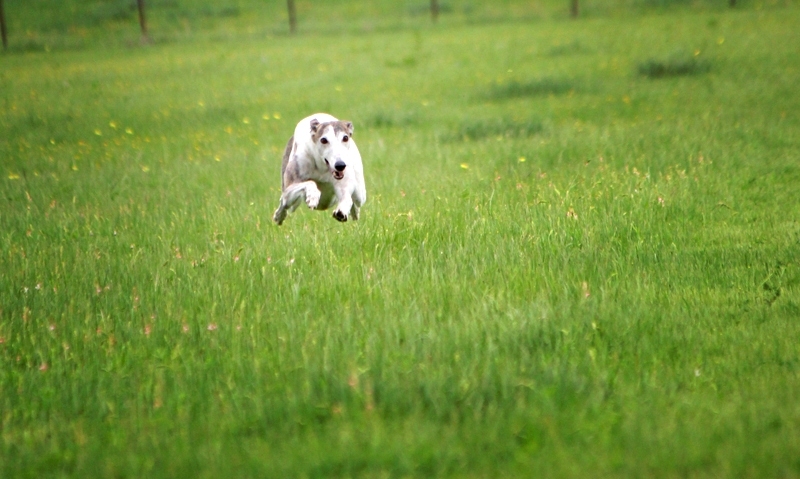 After a chilly start, it warmed up a little and was a perfect sunny day for the dogs to run in the country. 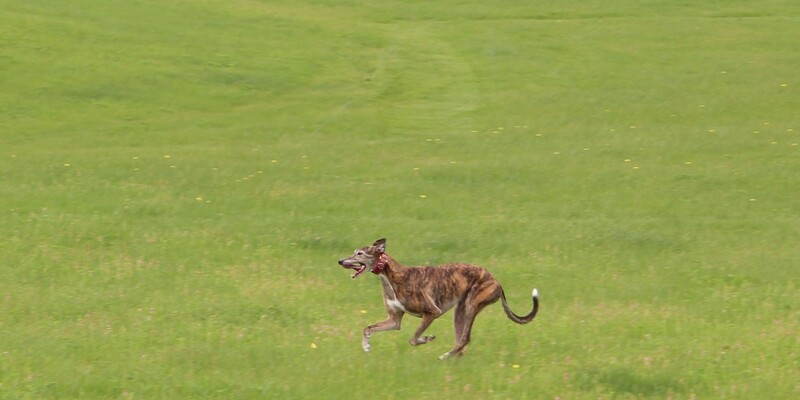 It was much better than running in the heat. 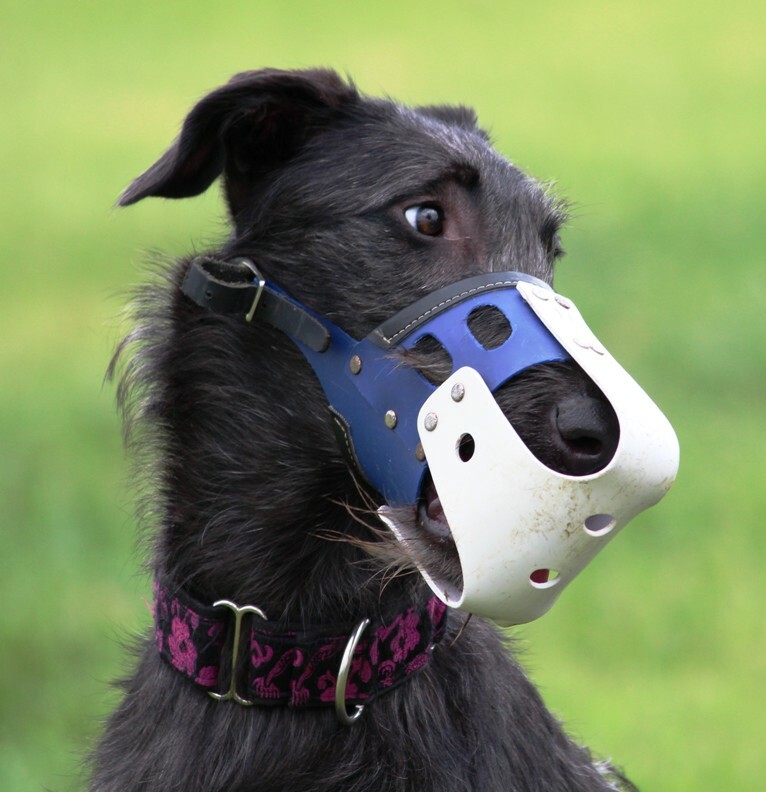 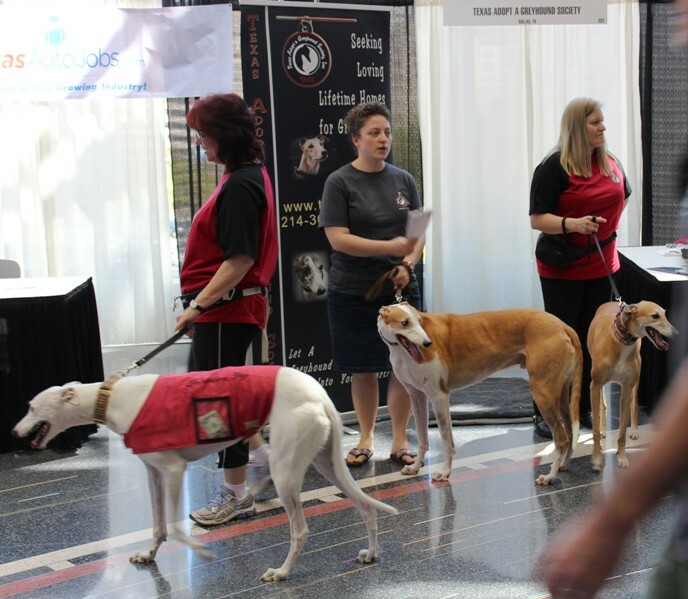 There were more Greyhounds there than other sight hounds but many other sight hound breeds were represented: Basenji, Whippet, Saluki, Scottish Deerhound, Borzoi, and Italian Greyhounds. 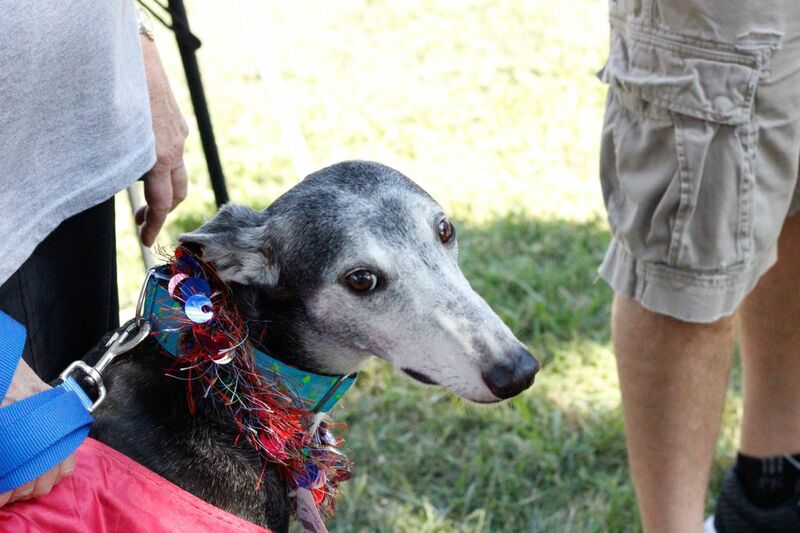 A few non-sight hounds also ran the course – a Golden/Lab and an Australian Shepherd (when someone jokingly commented that the Australian Shepherd was an odd looking Greyhound, her owner said “that’s her Halloween costume.”) Cricket was injured but is now recovering. 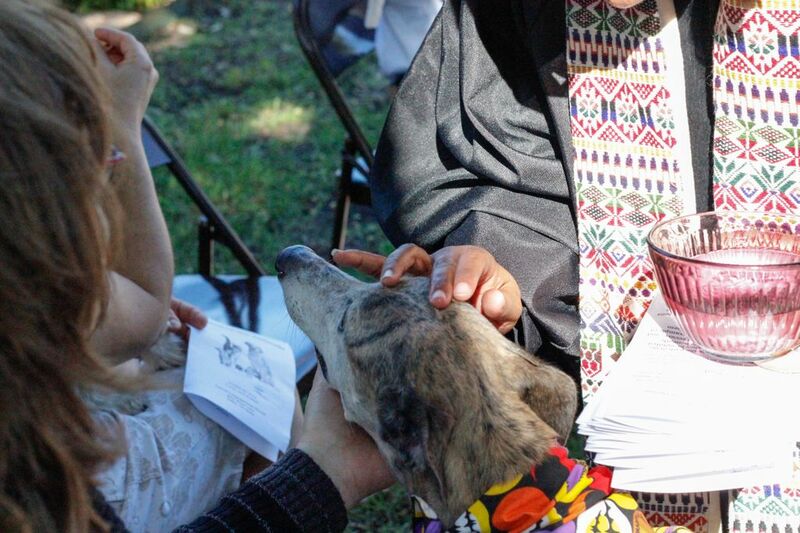 Everyone wishes her well. 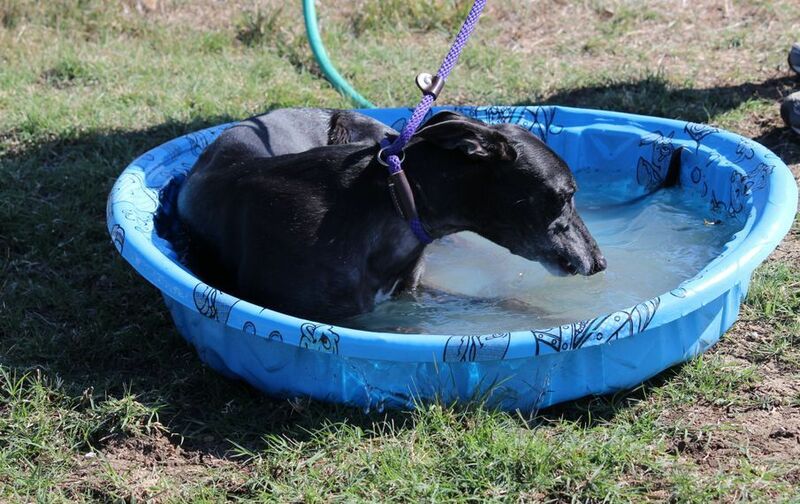 We only saw one dog lying in the kiddie pool. 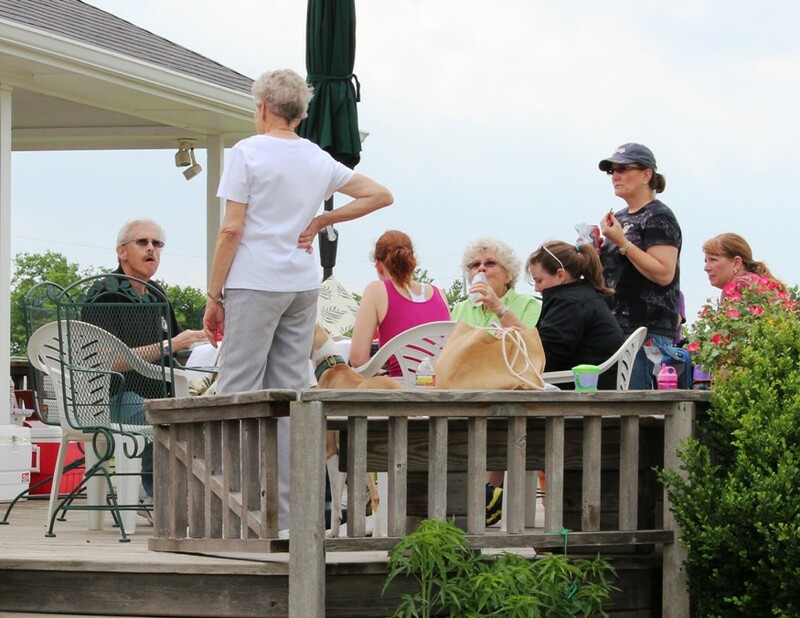 Lunch of chili (of various “heat” levels) , cornbread and all the “fixins” was again generously provided by Kris Schuster. 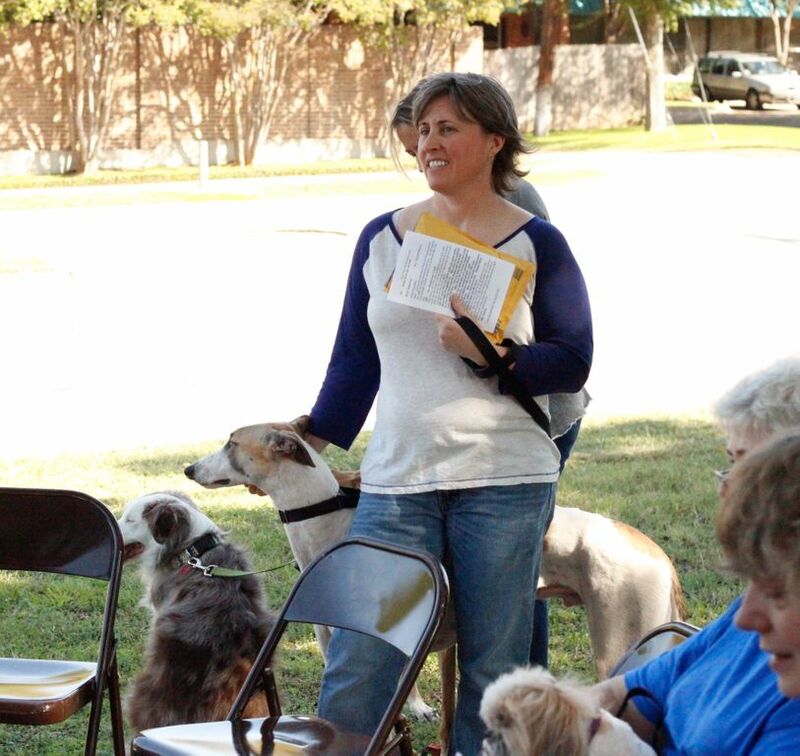 There were lots of empty bowls but not much chili left at the end. 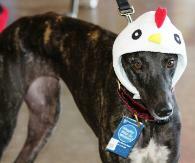 A bunny cake, cupcakes and homemade ginger snaps topped it off. 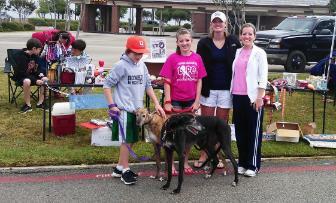 After lunch, many folks shopped for dog merchandise, which will help TAGS take care of more Greyhounds. 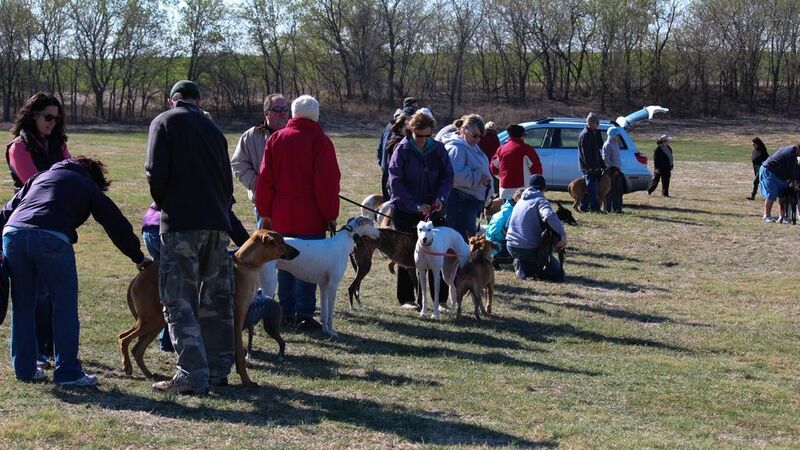 Many of the dogs were “repeats” but there were lots of new ones. 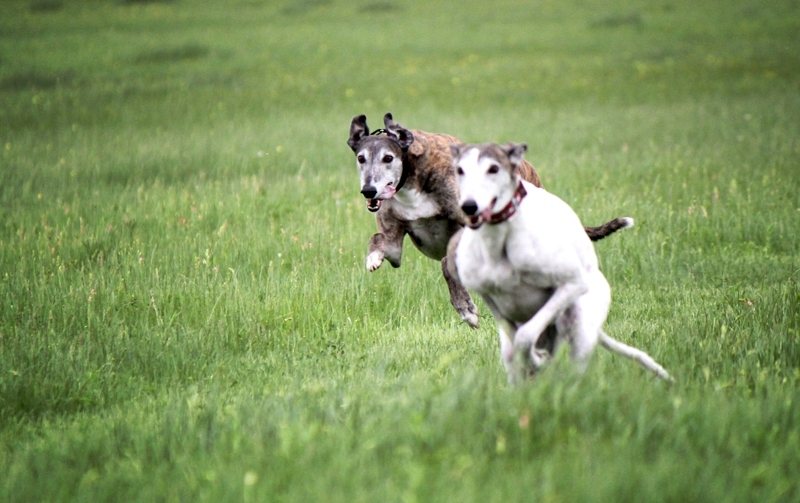 We hope everyone enjoyed watching the dogs run and play -- and most of all, we hope the dogs had fun. 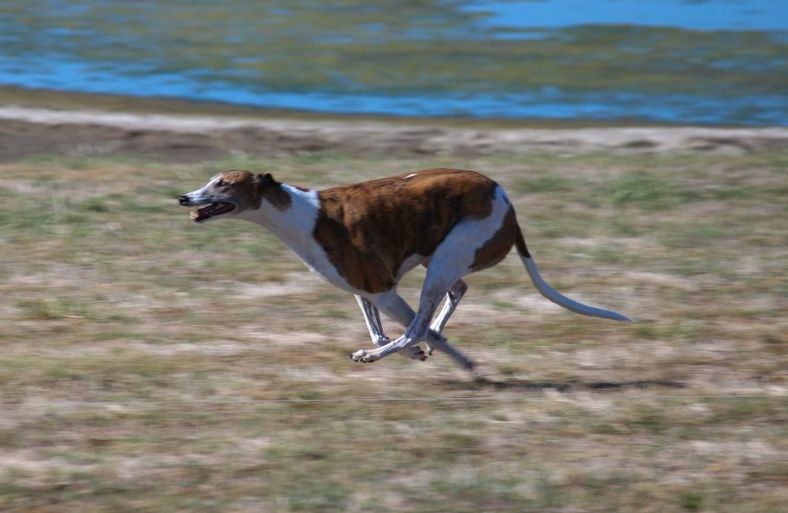 Enjoy the pictures of the day. 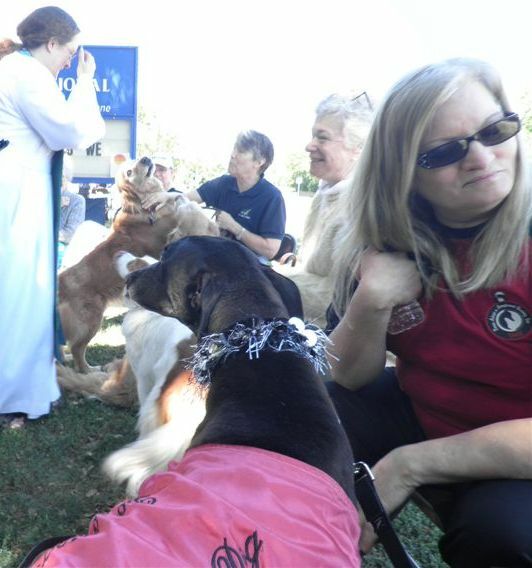 Saturday, October 20, 2012 - All God's Creatures Day - TAGS again participated in All God’s Creatures Day with success. 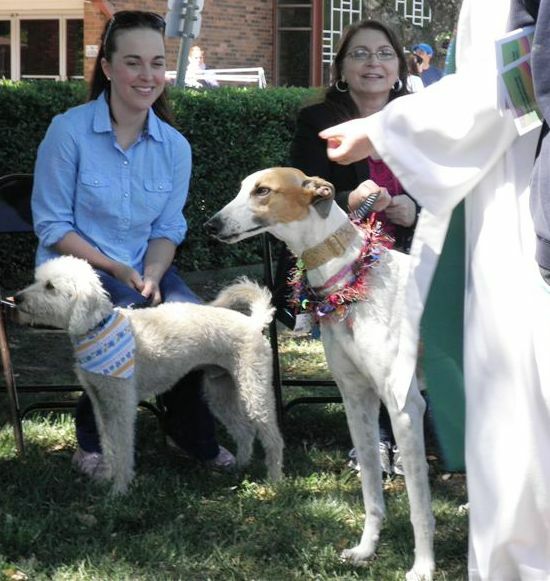 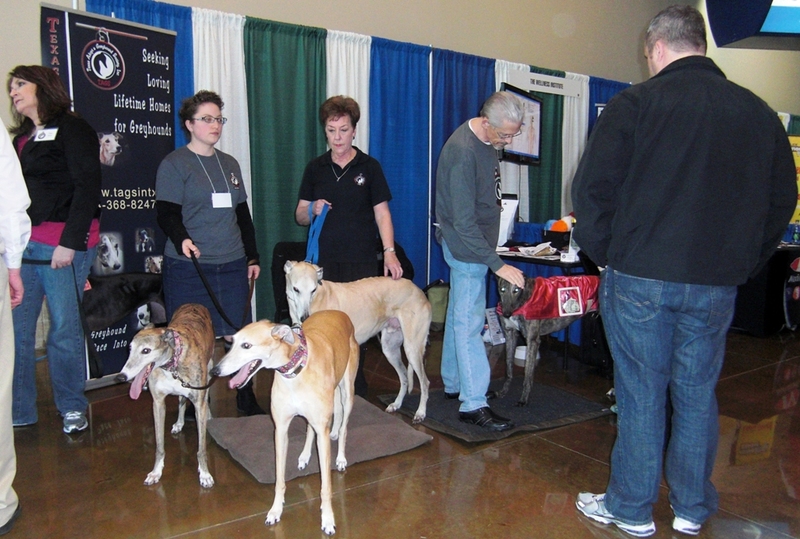 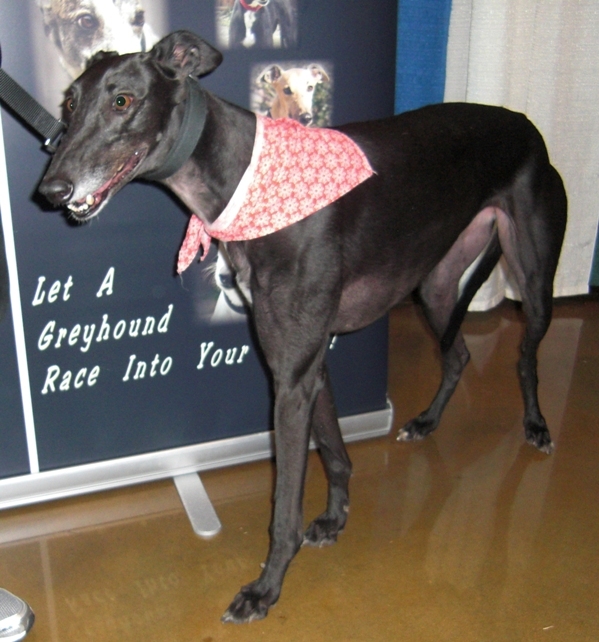 There was a lot of interest in Greyhound adoption and several of TAGS hounds were blessed – Hank, Gibbs, Sasha, Trudy and Tippi. 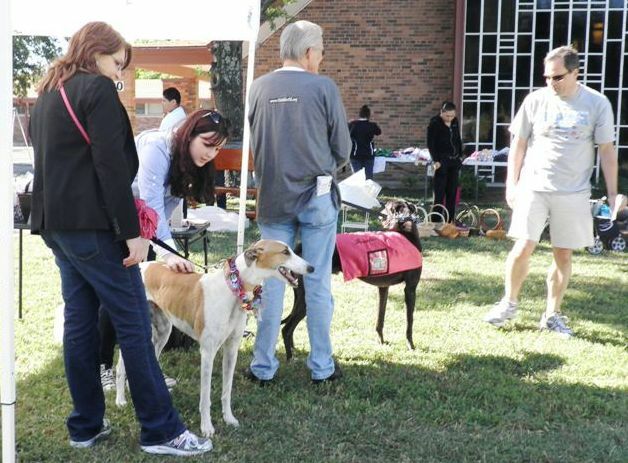 Sunday, October 21, 2012 – TAGS folks enjoying a fall walk with their Greyhounds. 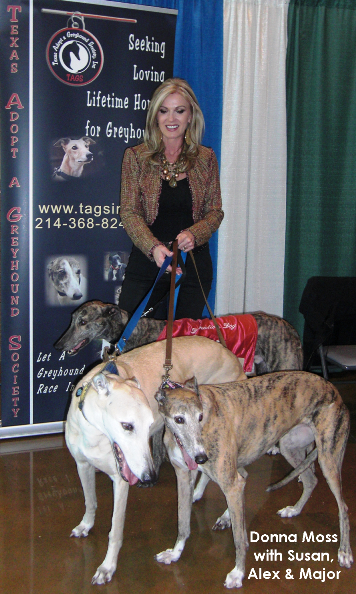 Saturday, September 8, 2012 – TAGS and all four of its available Greyhounds were welcomed to a new venue, Woof, in Plano on Saturday. 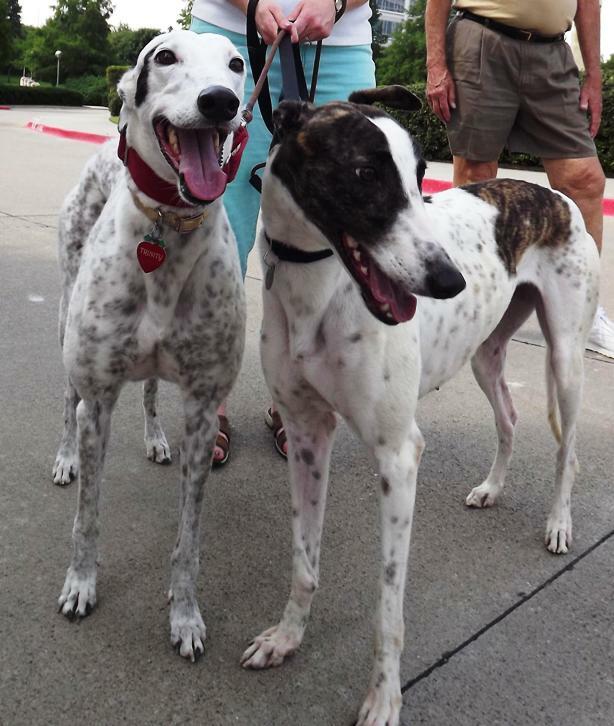 It was a most exciting day for one of TAGS dogs, Tasha, who was officially adopted by her foster family and Greyhound brother, Luki, who she brought with her. 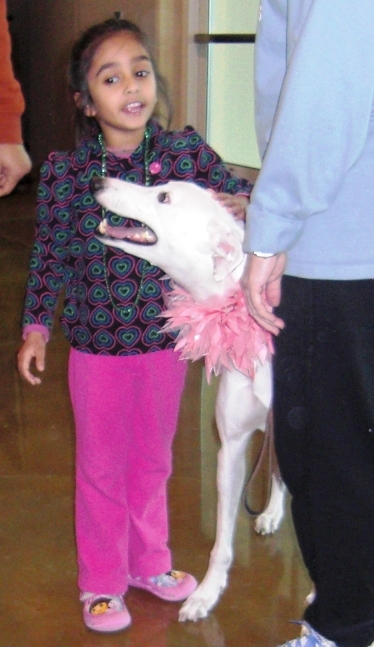 She couldn’t have found a better forever home. 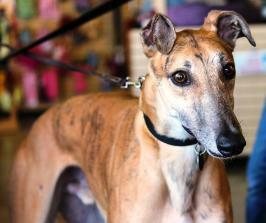 Woof is a large dog supply store, and the dogs enjoyed shopping there (especially Gatsby, who touched everything, and Baby, who tried on Halloween hats). 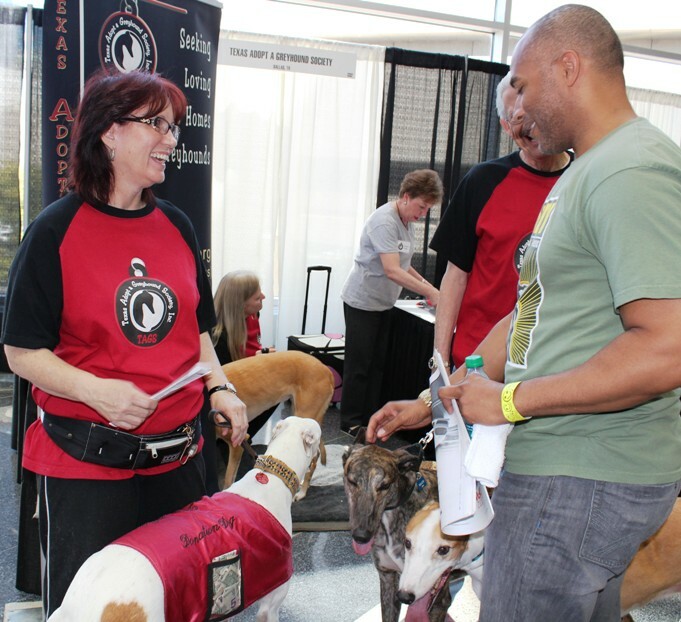 We will let you know when we will be at Woof again. 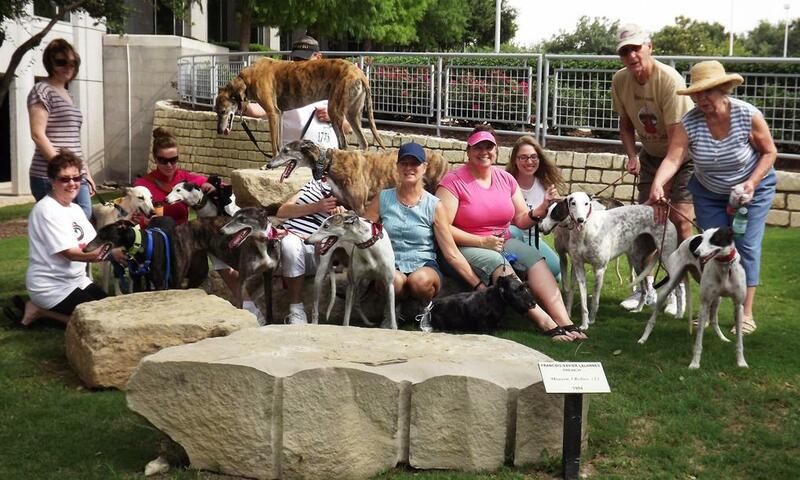 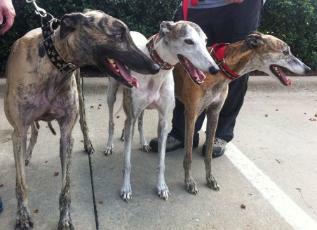 Saturday, May 26, 2012 – Greyhound owners brought their Greyhounds to Hall Office Park in Frisco for a walk to kick off the Memorial Day weekend. 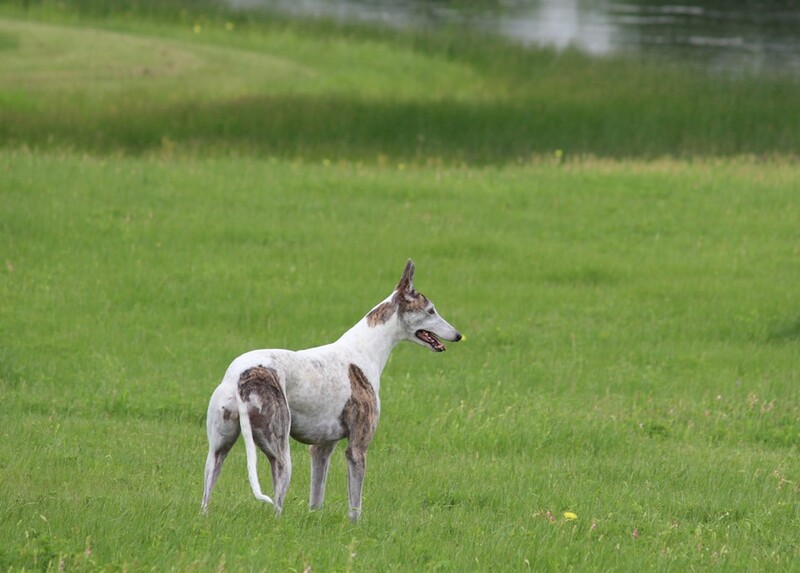 The cool, breezy weather and the beautiful scenery made for a relaxing walk. 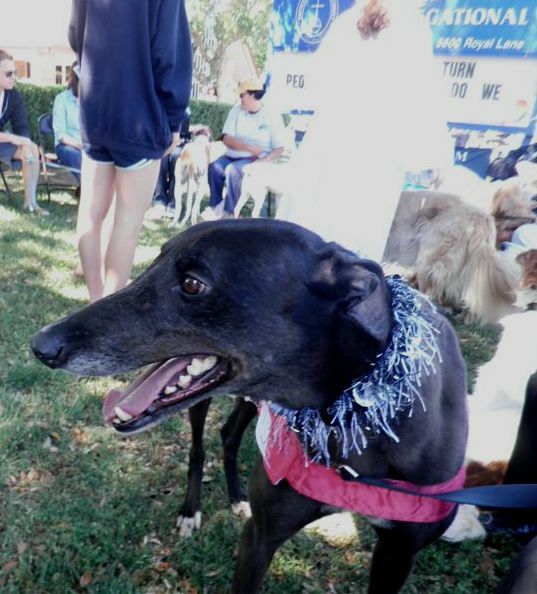 It was an especially big day for Kylie. 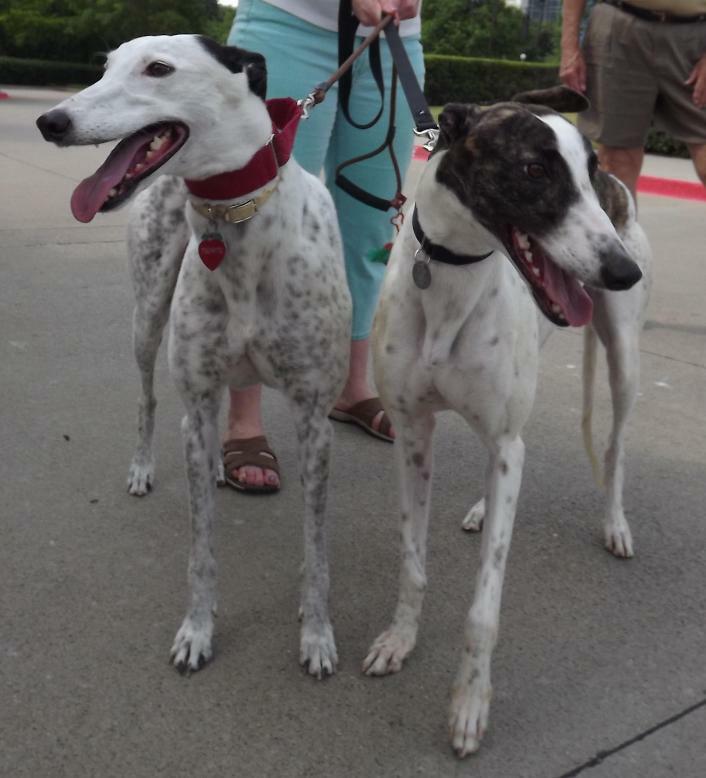 Ian and Sara met Kylie (who they have now adopted and renamed “Cricket”) and Kylie was reunited with her mother, Go Go Dream (now the Reinheimer’s Trinity). 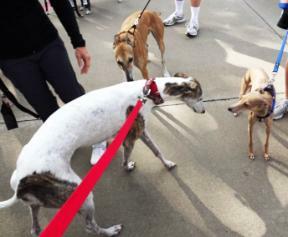 Everyone enjoys seeing other Greyhounds and comparing notes. 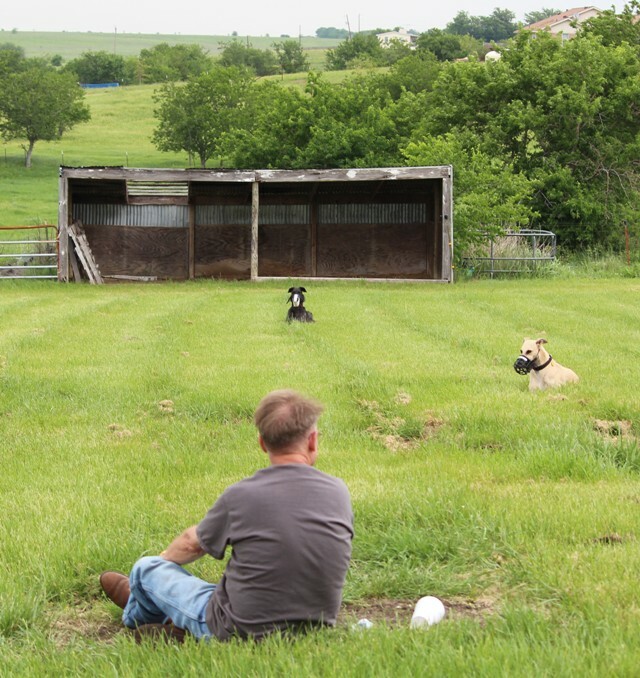 We’ll do It again. 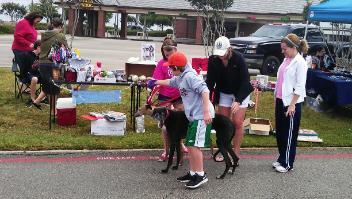 Frisco Mercantile’s first parking lot sale on Saturday, May 12, 2012, definitely drew a crowd. 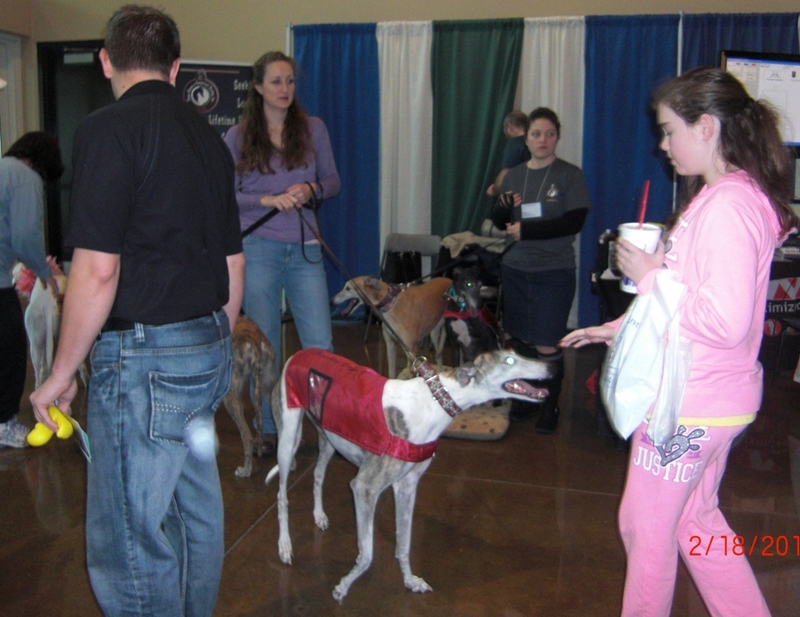 People seemed to be more interested in petting Greyhounds than buying merchandise, but that was a good thing for TAGS. 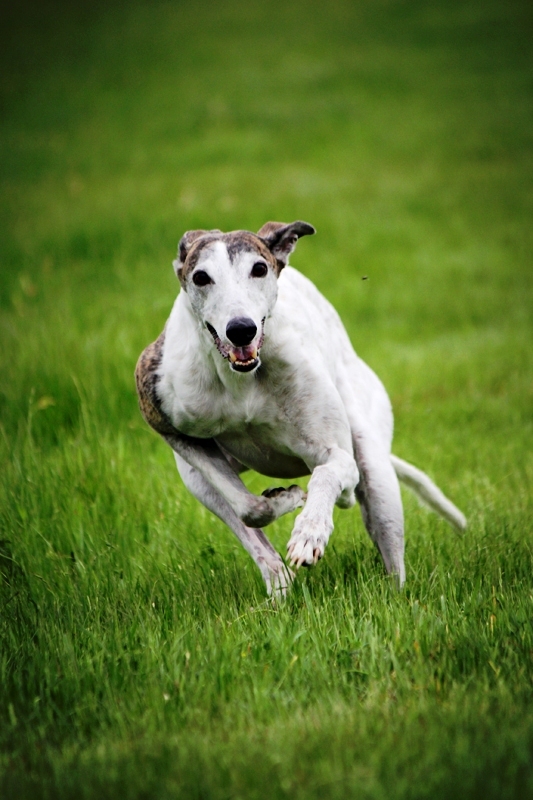 Getting an application for adoption of a greyhound is always a cause for celebration. 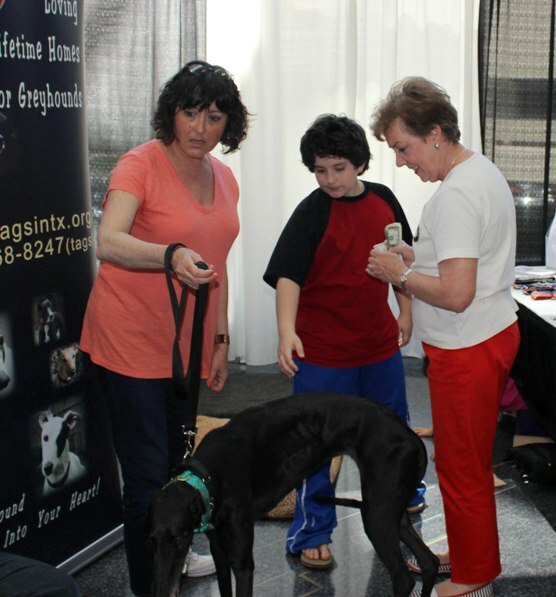 Saturday, April 21, 2012 ~ All God's Creatures Day: Central Congregational Church (Pet Adoption Day) All God's Creatures Day was another successful day for TAGS - and a gorgeous spring day it was. 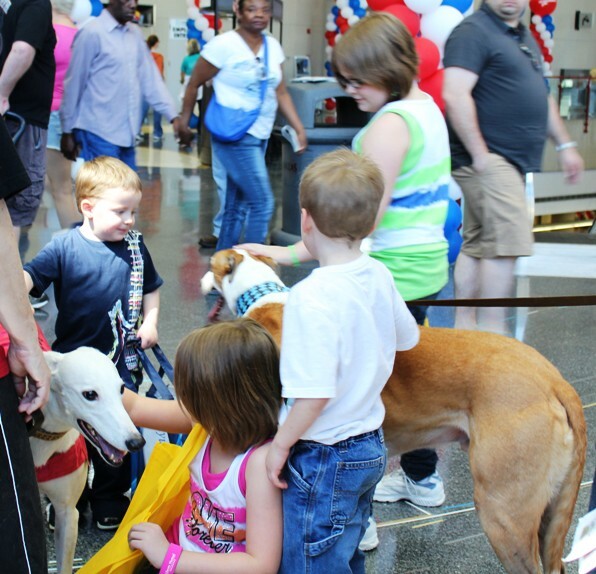 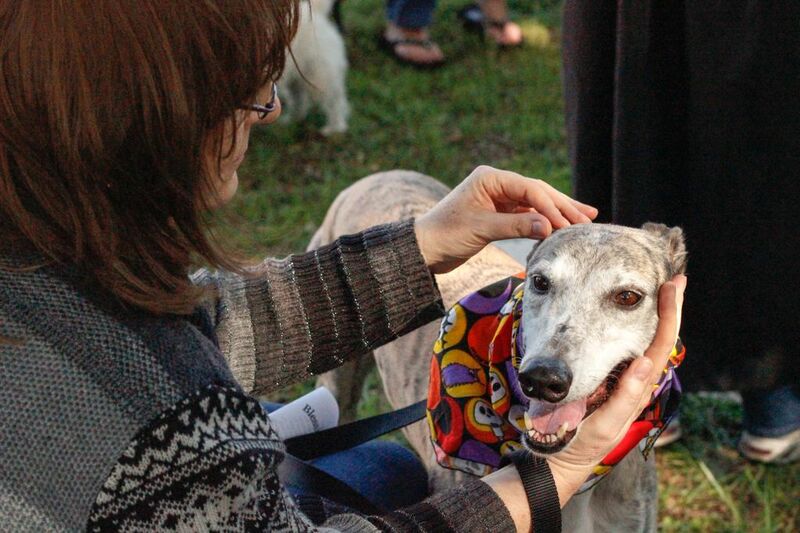 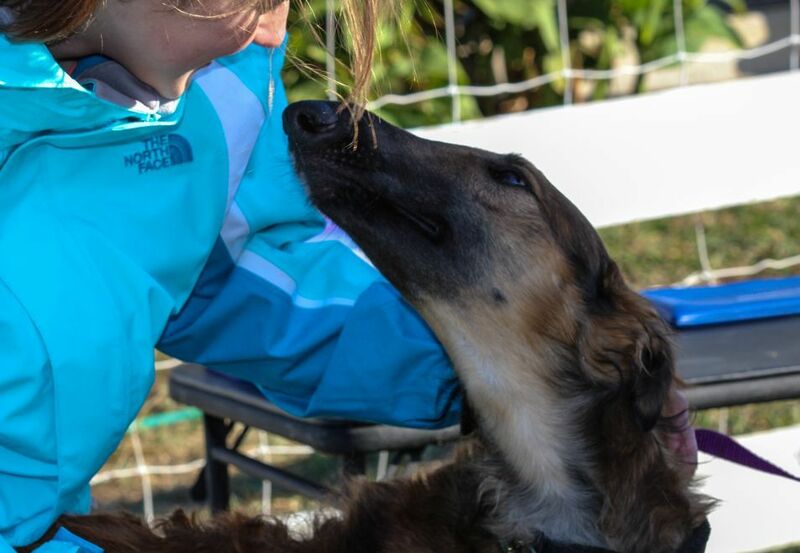 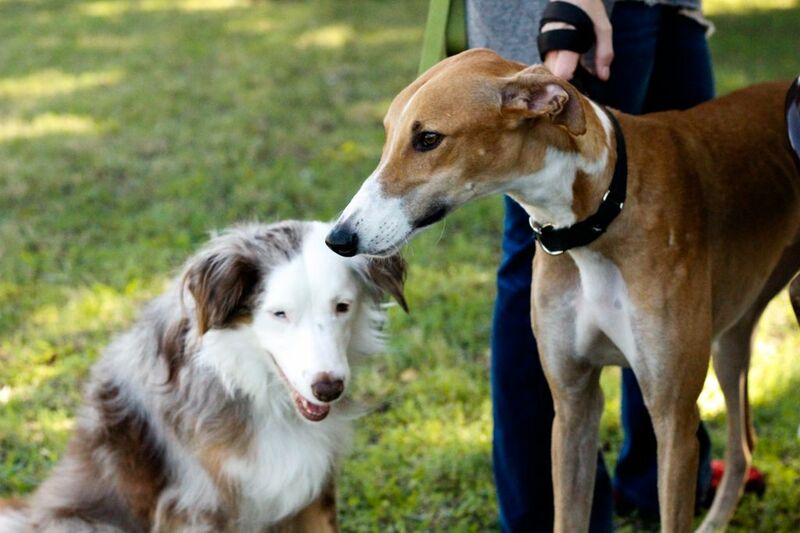 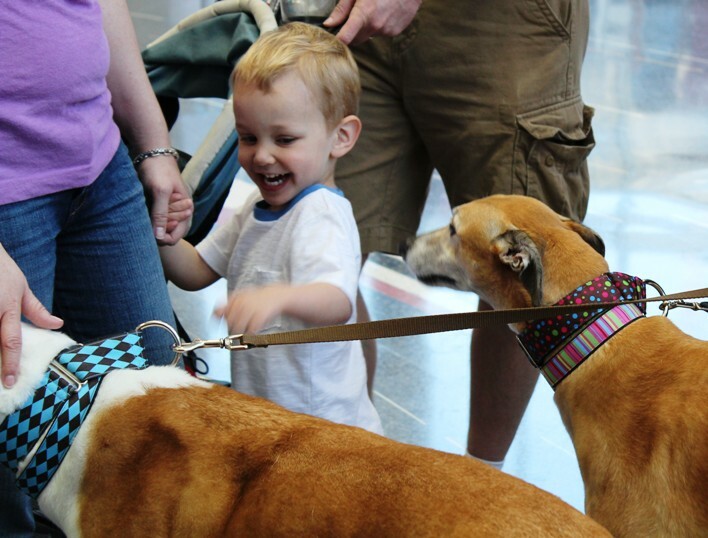 TAGS and the Greyhounds made many new friends (of small dogs, mixed breed dogs, rescue workers and event visitors). 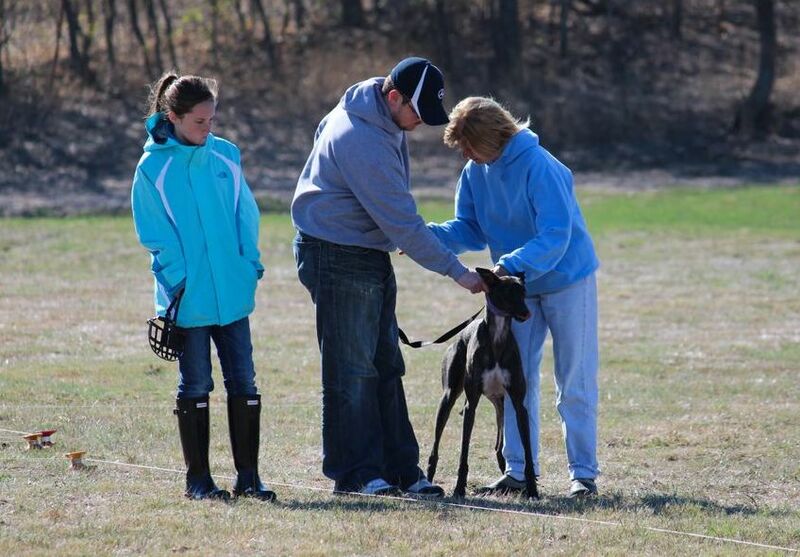 It may have also been a life changing day for Gabe. 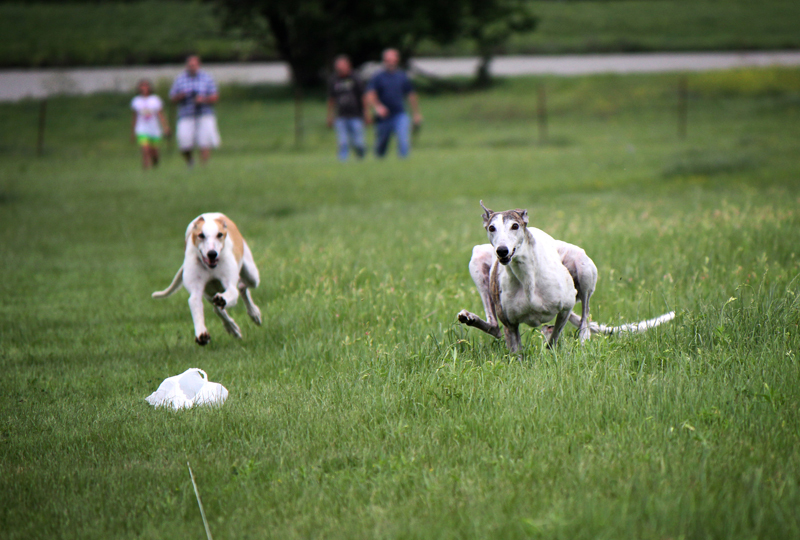 Saturday, April 14, 2012 ~ Greyhound Lure Coursing & Play Date at Haggard's Farm: Nearly fifty people and more than fifty Greyhounds enjoying a windy, cloudy day in the country was a sight to behold. 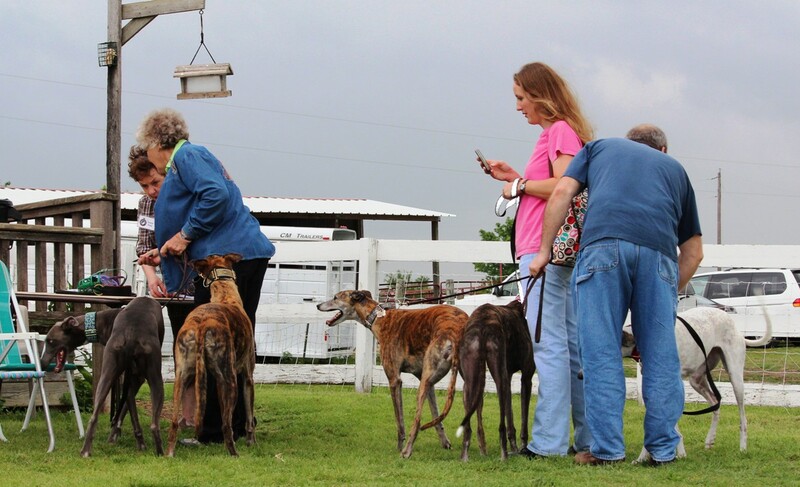 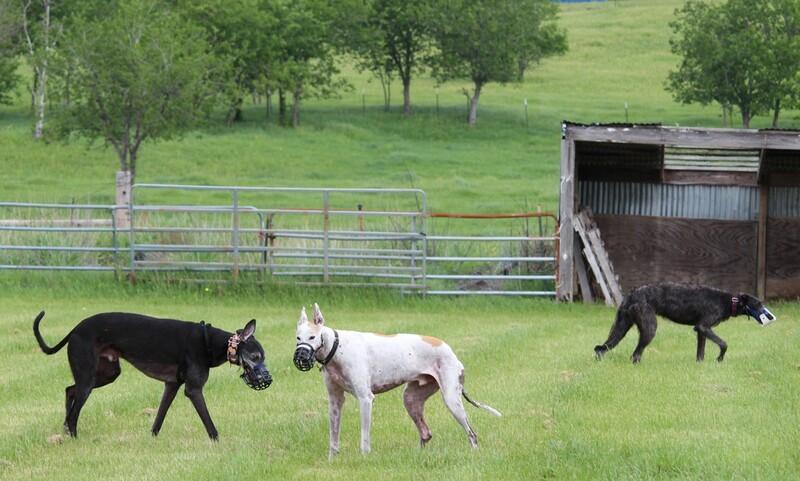 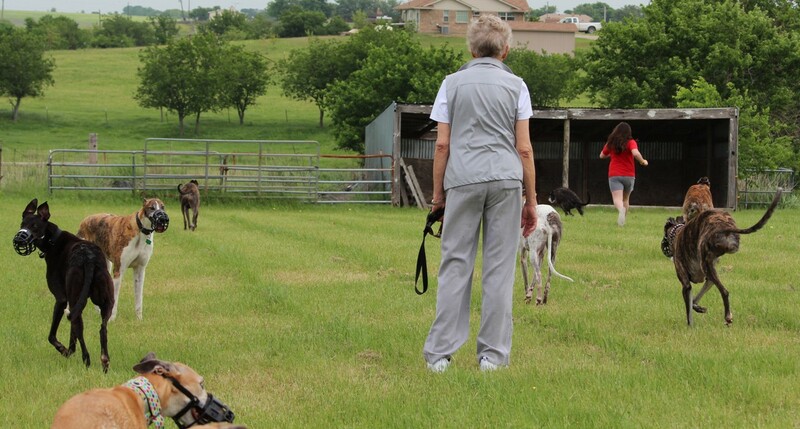 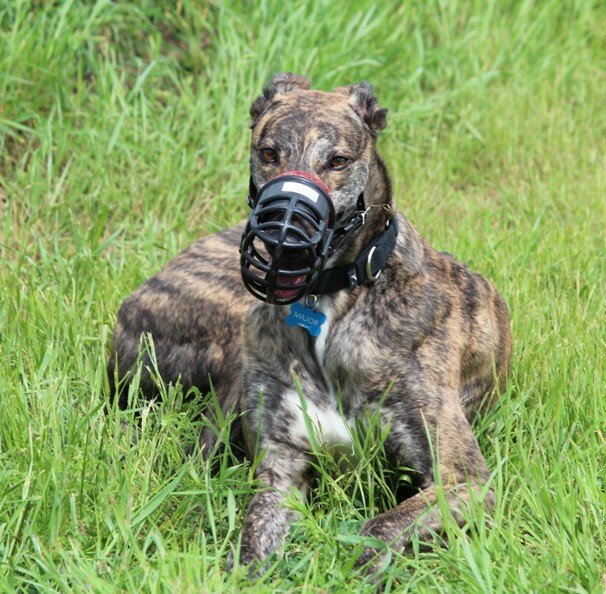 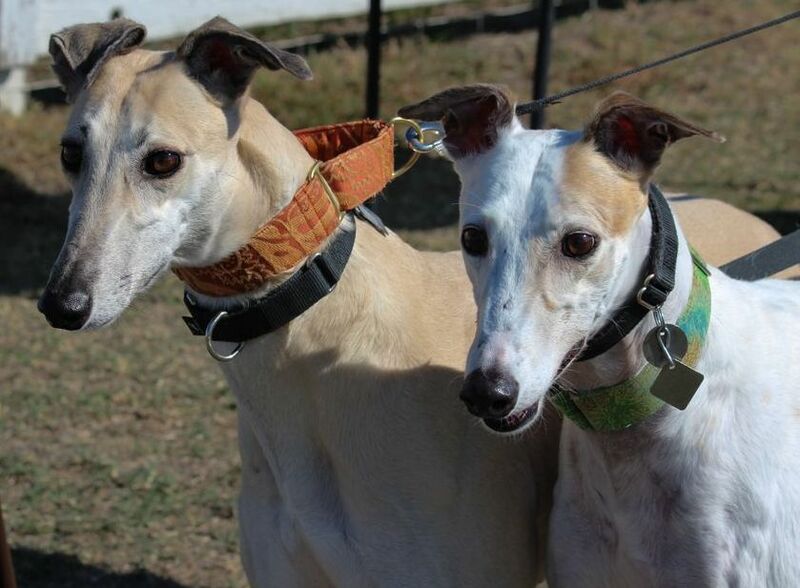 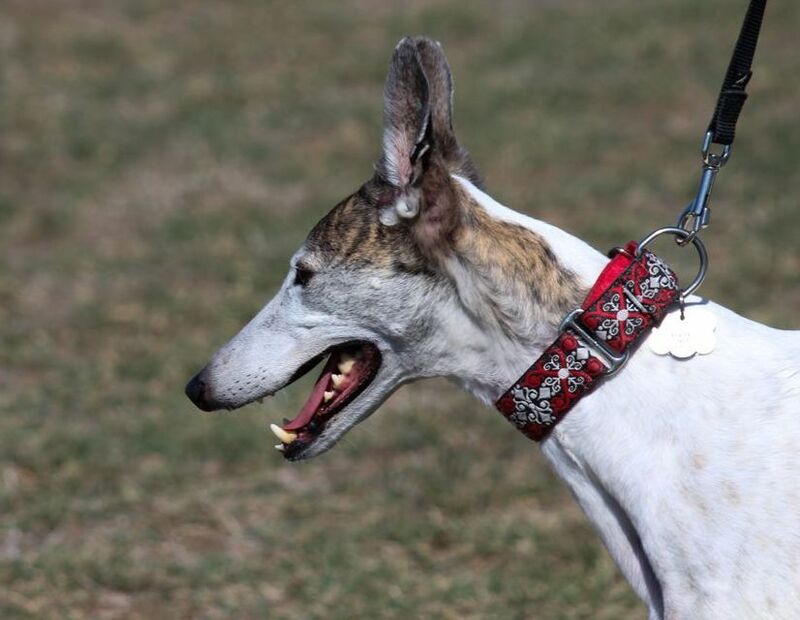 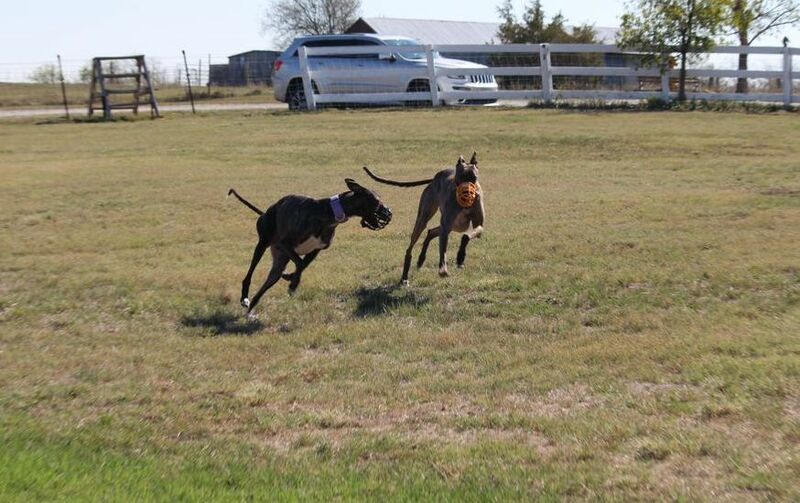 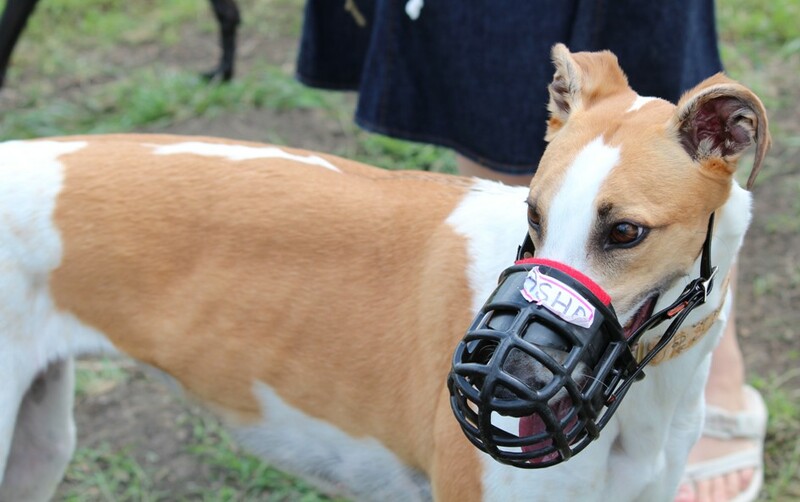 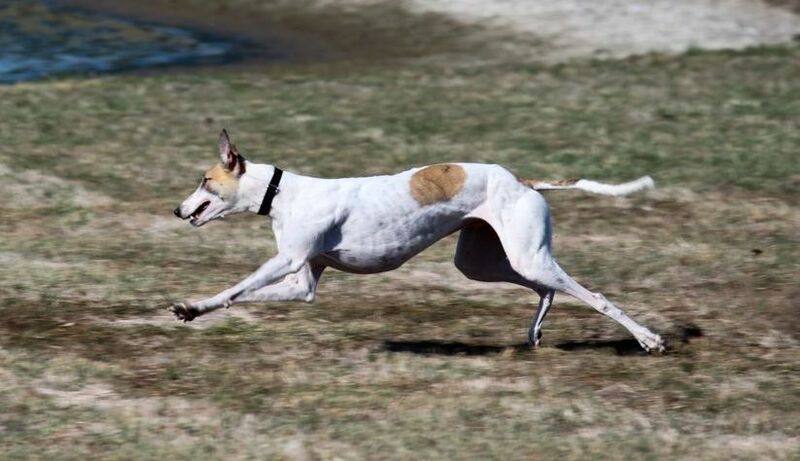 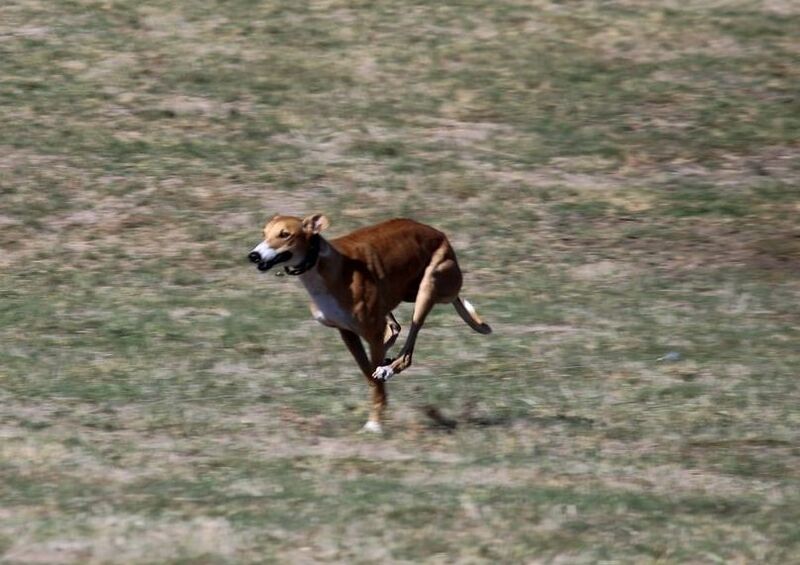 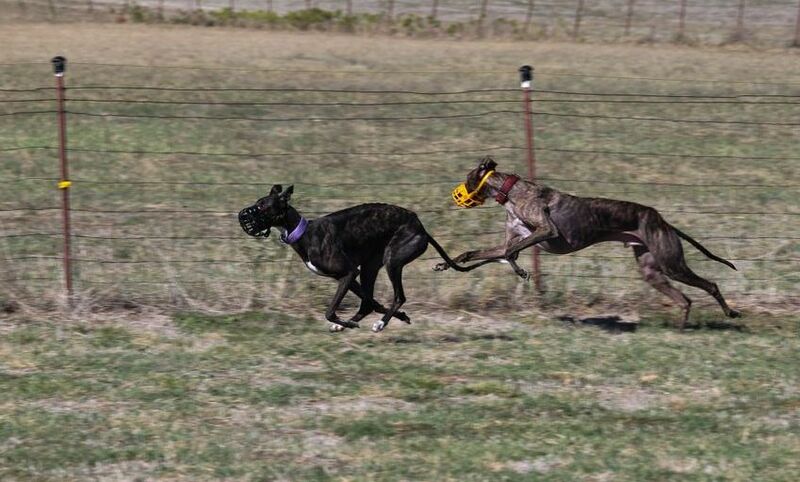 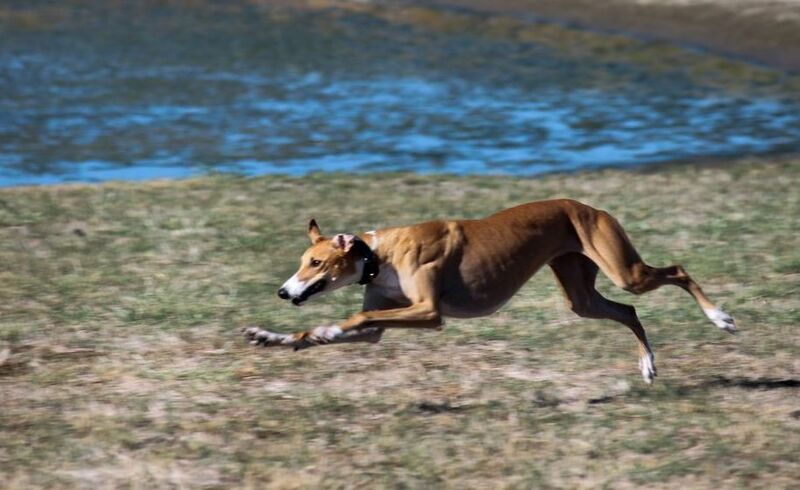 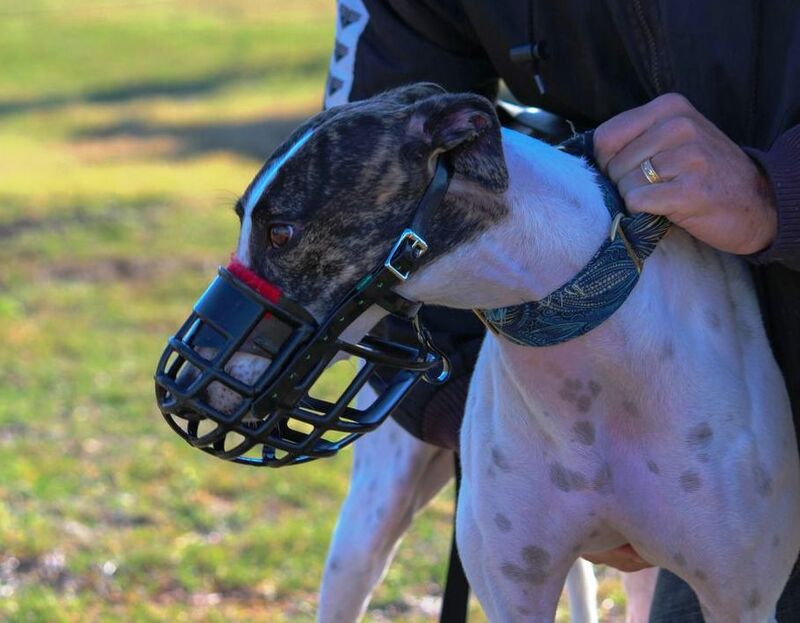 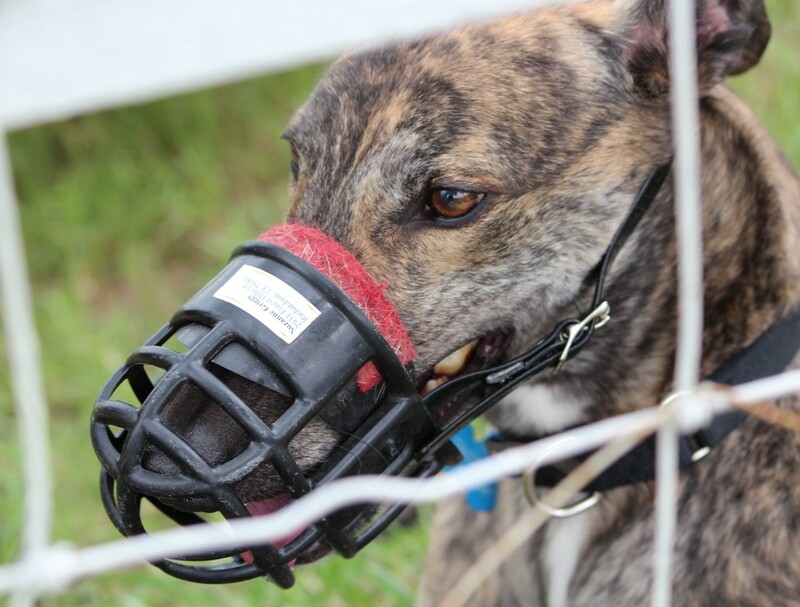 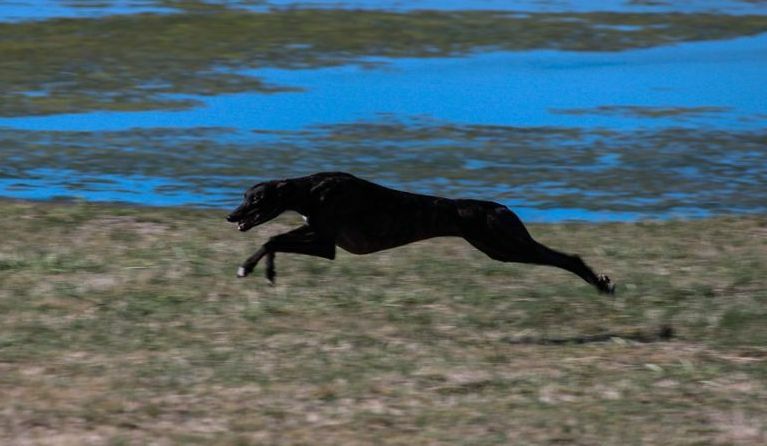 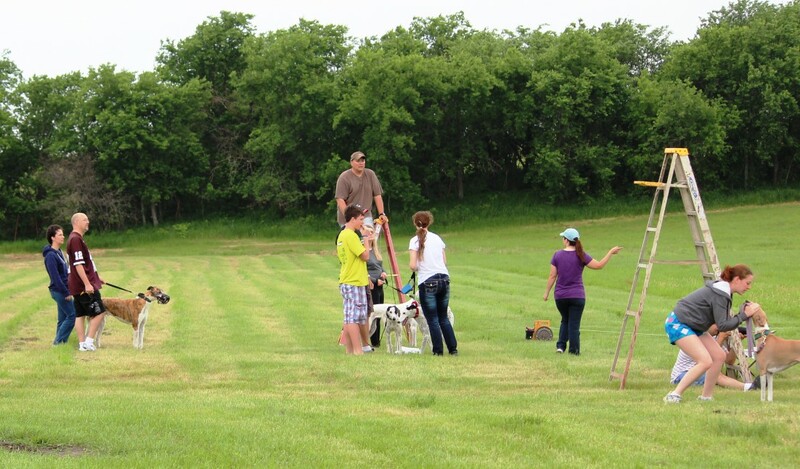 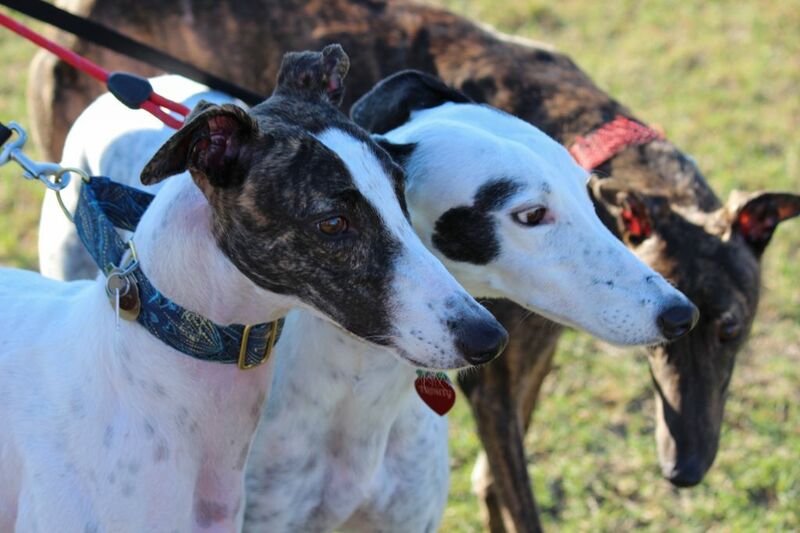 Watching Greyhounds fly across a green grassy field after a “bunny” or run the perimeter of the play yard as other Greyhounds coursed through the field was the TAGS Greyhound Lure Coursing day at Sam and Deann Haggard’s farm in Celina. 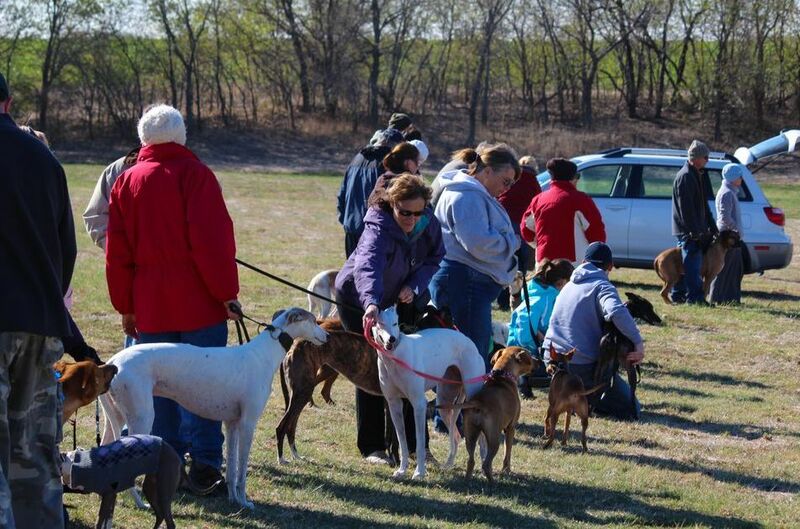 After the dogs had exhausted themselves, everyone satisfied their appetites with a delicious lunch provided by Kris Schuster. 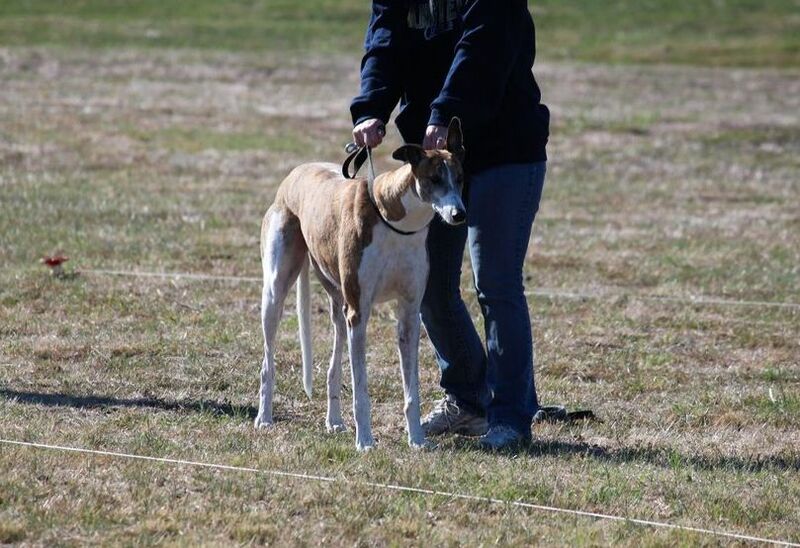 Thanks to Richard McClure for taking wonderful pictures of the running Greyhounds and April McClure for helping with lunch and helping with the dogs. 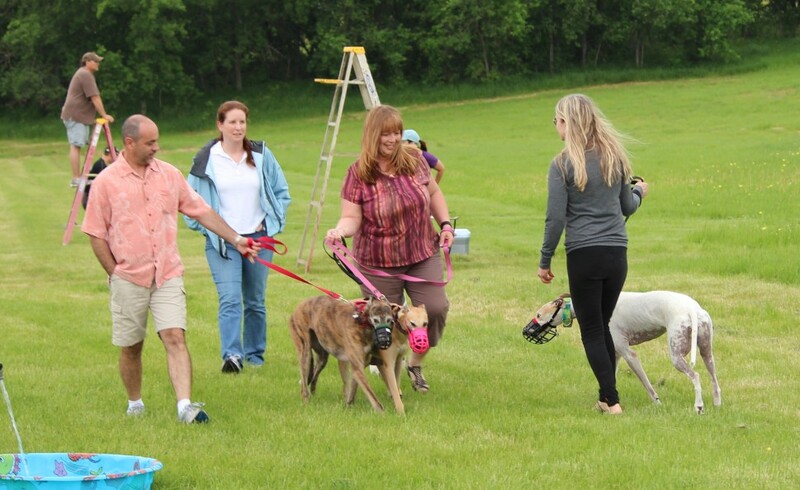 It took the efforts of all the TAGS volunteers (Lindsay, Ken, Barb, Sarah, Dana, Gail, Rock and Suzanne) to bring about this successful day. 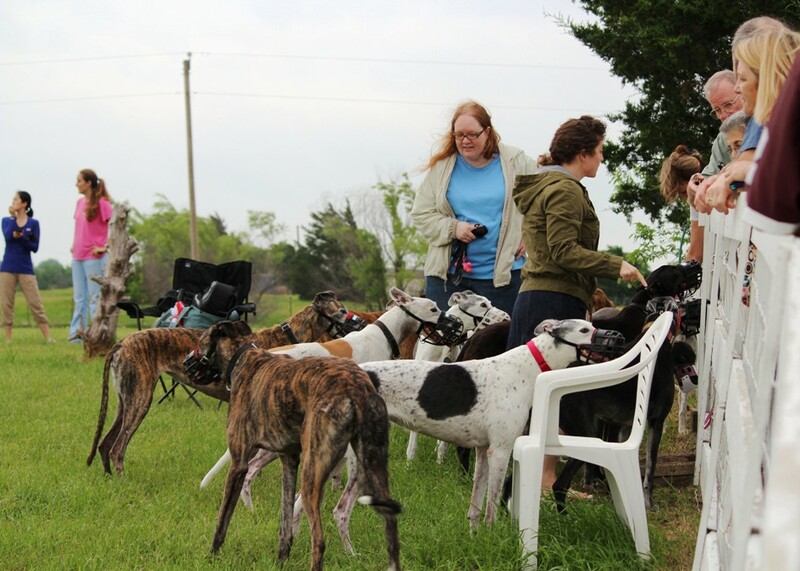 If all the Greyhounds weren’t so tired, they would join in a rowdy THANK ROOOO to the Haggard’s for opening their home to all the Greyhounds and their people. 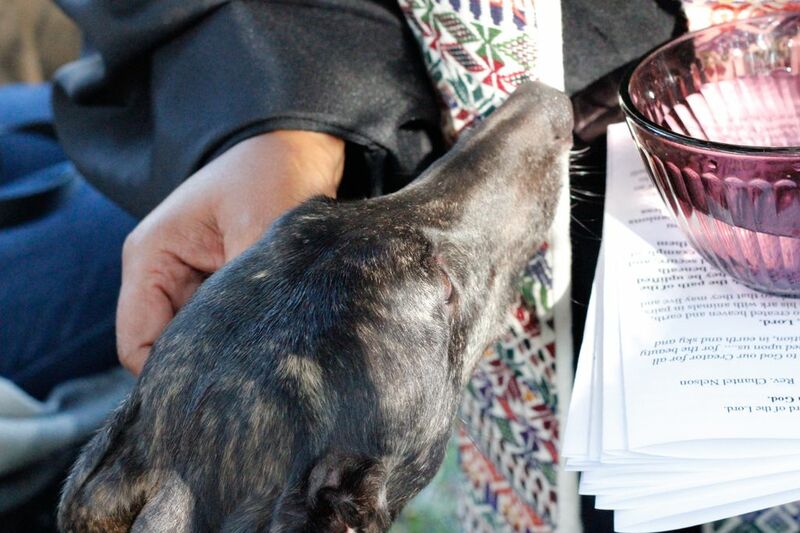 It was an event you just had to experience. 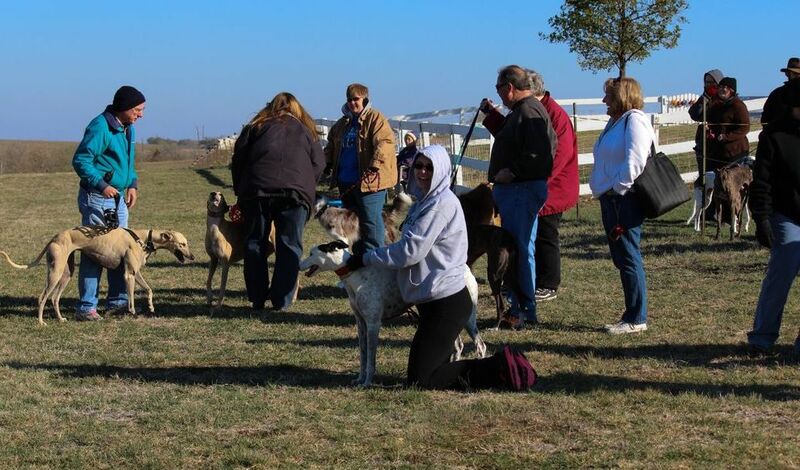 If you missed it this time, we hope you will be there next time. 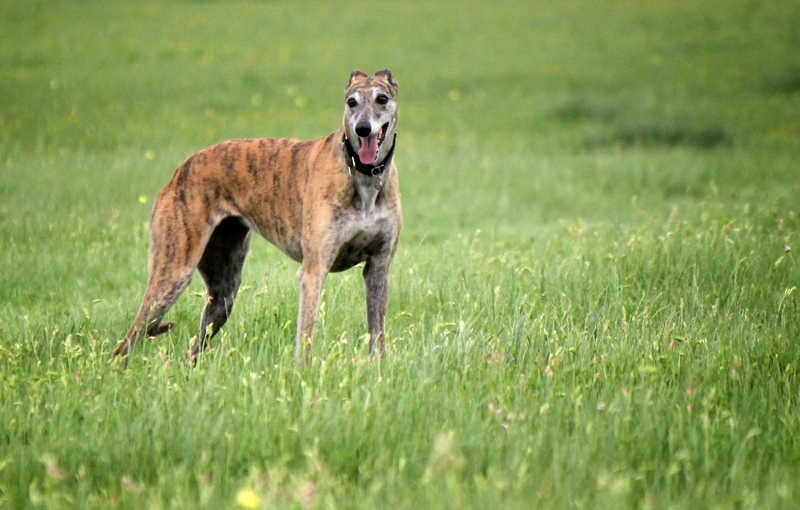 See TAGS Tales for more pictures and videos. 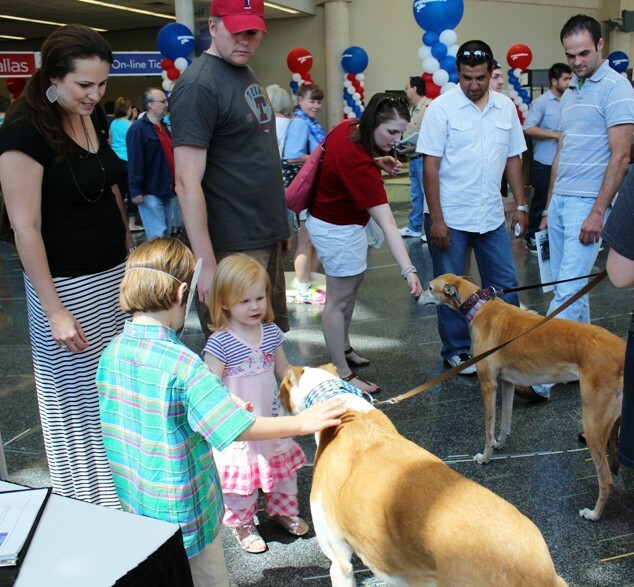 Saturday & Sunday, March 24 & 25, 2012 ~ Dallas Auto Show 2012: It was a successful weekend all around. 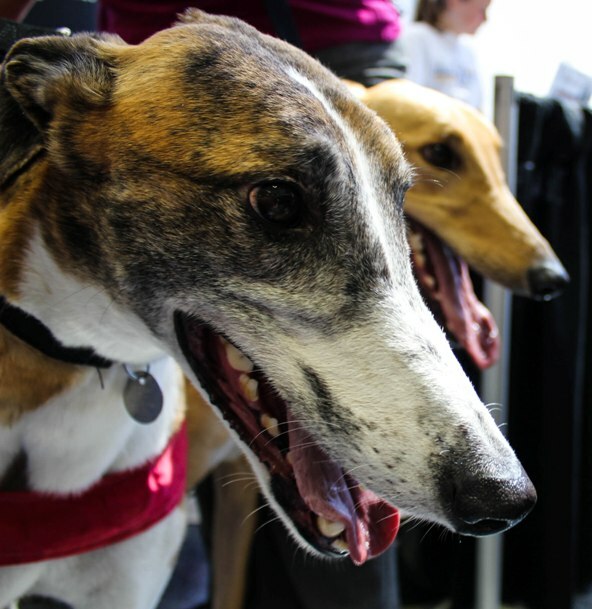 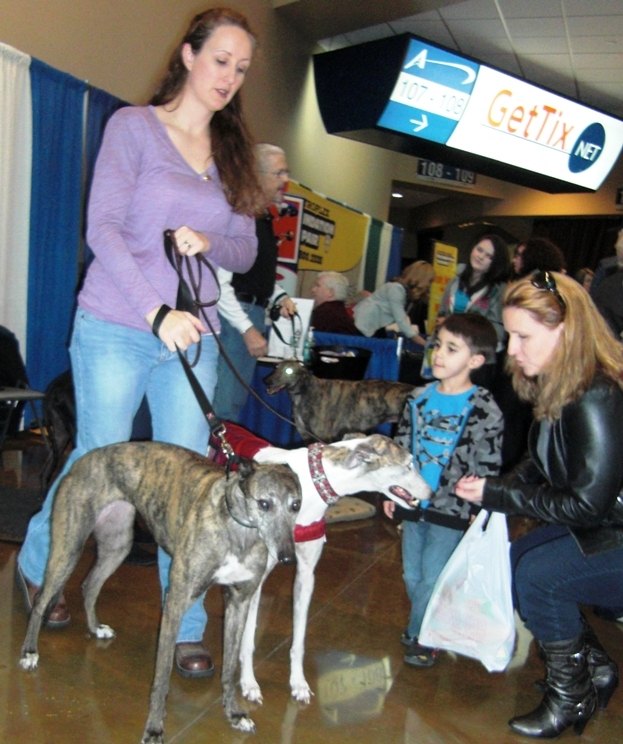 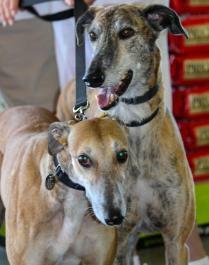 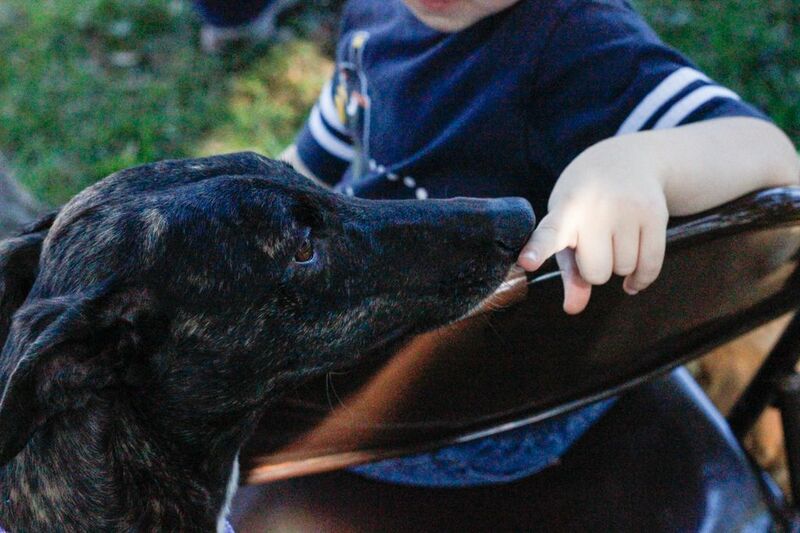 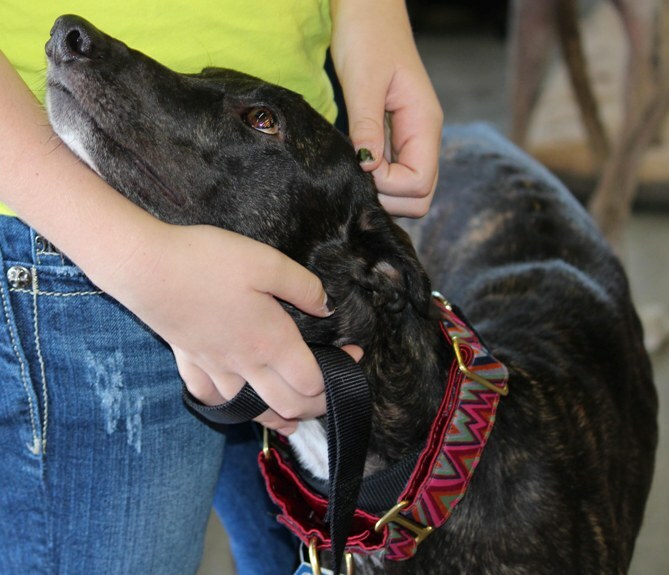 The public was fascinated by the Greyhounds, interest was high, and everyone loved petting the dogs. 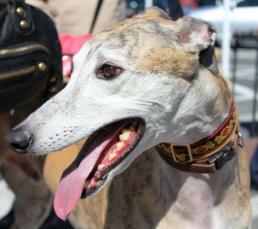 But, best of all Pippi met her new family and Prince made what will probably be his last appearance as an adoptable Greyhound. 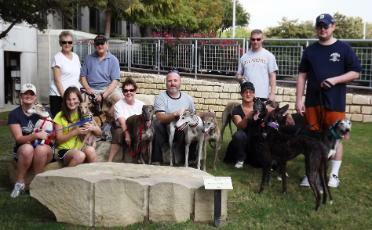 Thanks to all the TAGS volunteers for a greyt weekend. 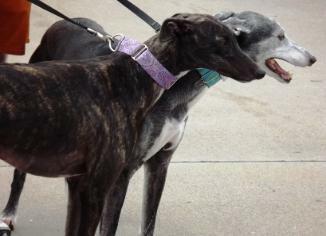 Saturday, February 25, 2012 ~ Whole Foods Market: Not only did Prince and other available TAGS Greyhounds enjoy the nice weather at this meet and greet, TAGS adopted Greyhounds, Luke and Ringo enjoyed their visit too. 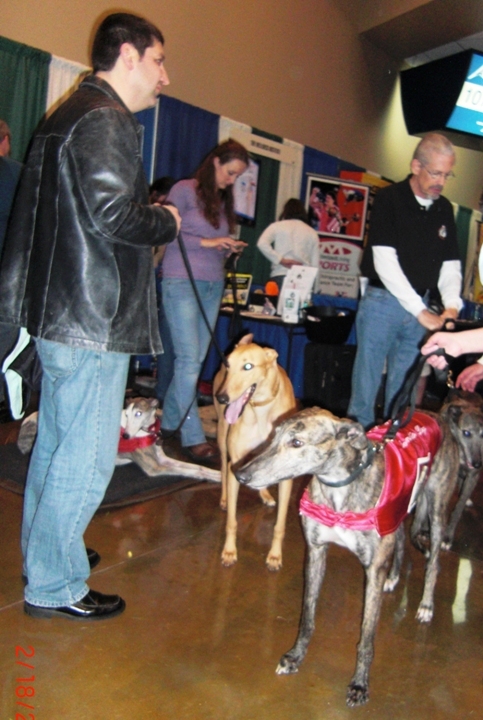 Saturday & Sunday, February 18 & 19, 2012 ~ Collin County Home & Garden Show, Allen, TX: What a success this year’s show was. 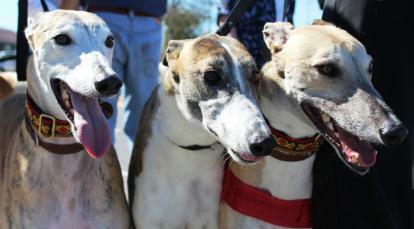 There was lots of interest in adopting Greyhounds, learning about Greyhounds and donating to Greyhound rescue. 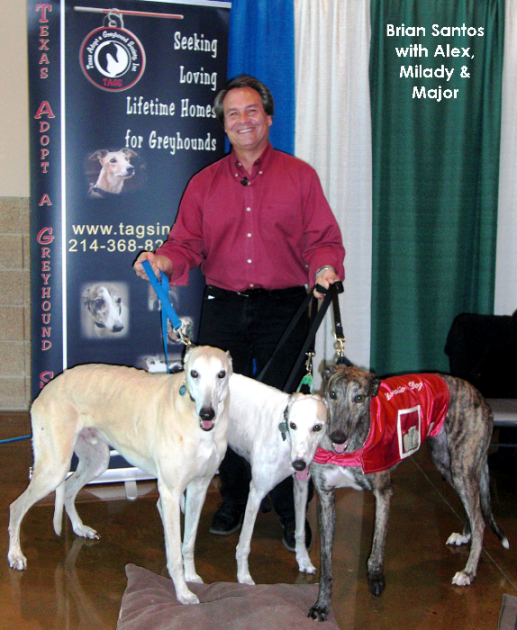 The two show celebrities, Brian Santos and Donna Moss, were very gracious to have their pictures made with the Greyhounds. 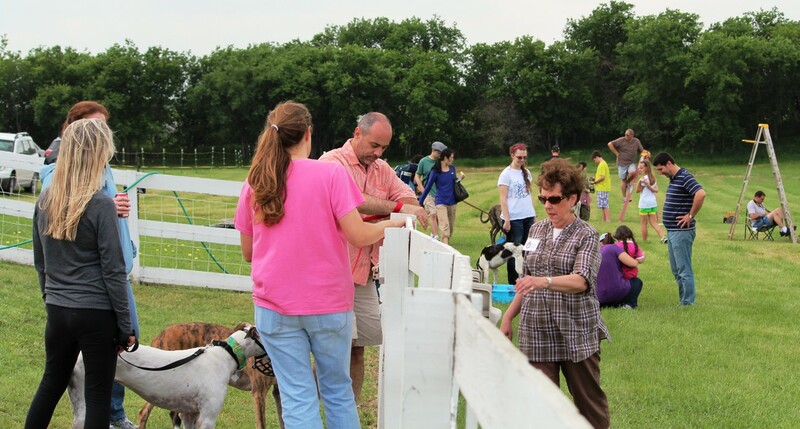 Thanks to Peggy, Lindsay, Barb, Sarah, Aaron, Sara, Sally, Leo, Ken, Suzanne and Dana for volunteering your time and bringing Greyhounds, Pippa, Ruby, Prince, Lizzie, Zorro, Susan, Lass, Maggie, Baxter, Pippi, Major, Alex and Milady. 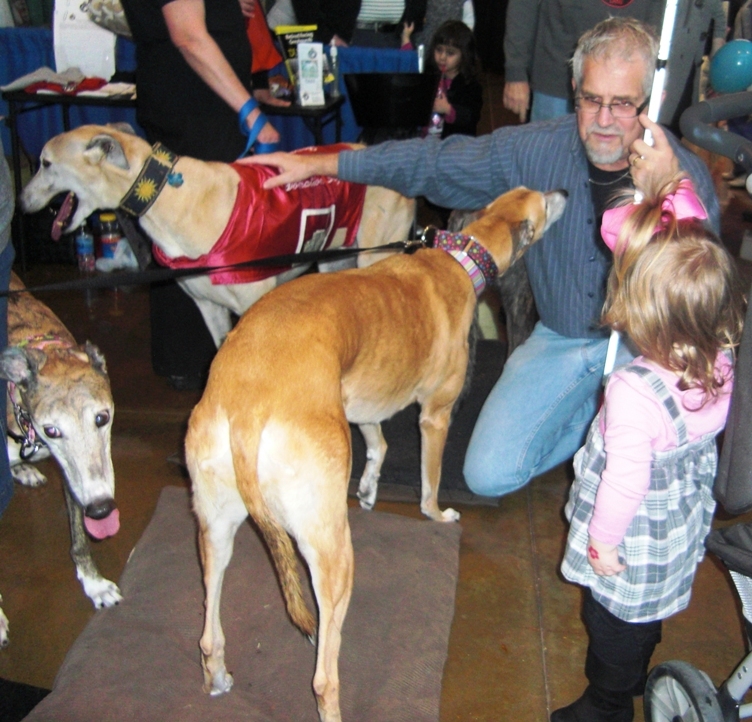 All of the dogs were wonderful Greyhound ambassadors. 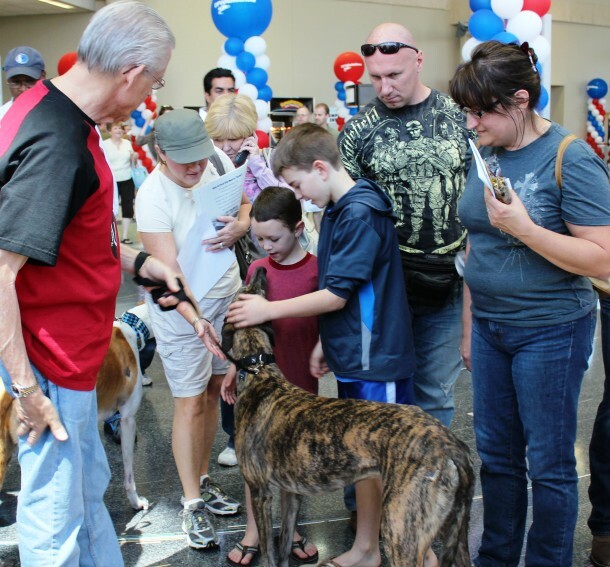 We could not have had a successful weekend like this without your help.